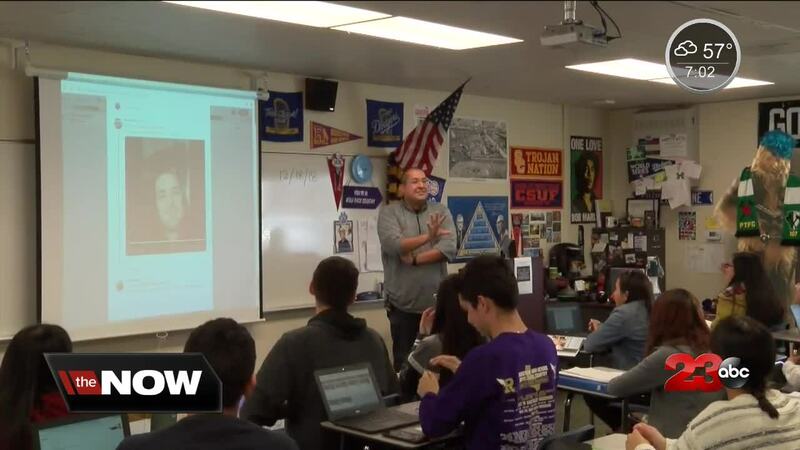 Derek Carr responded to a tweet about an alternate exam for a world history class at Ridgeview High School. BAKERSFIELD, Calif. — Oakland Raiders quarterback Derek Carr has responded to students at Ridgeview High School who were looking for his help. The teens took to social media on Monday morning to say that if Carr tweeted a shoutout to their high school in Southwest Bakersfield, they would get an easier history final. "If Derek Carr tweets a shoutout to Ridgeview High School in Bakersfield, CA by 12/18, Donez's World History class won't take the scheduled final exam and will instead take an alternate exam." According to the Ridgeview history teacher, Marc Donez, he was not expecting this response at all and neither were the students. "I'm shocked, surprised, excited," said Donez. "Mostly for the kids. It's a way for them to relax before finals." "I hope that they learn that their voice matters and that they have power with their voice and I hope that they use it for good moving forward," said Donez.